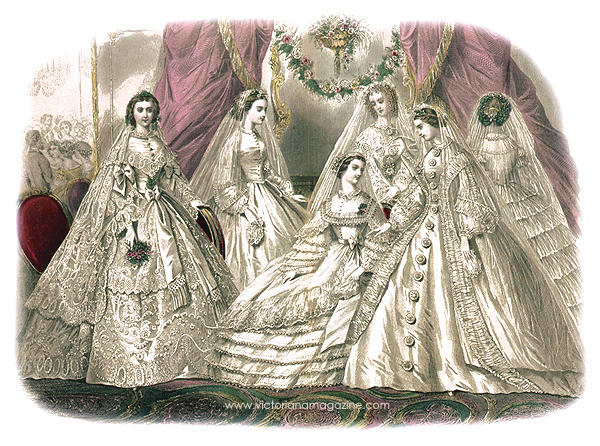 In 1861, Godey’s Lady’s Book advises that when one is considering a wedding dress, it will be seen that no person is confined to any single style or material. A bridal dress that would be becoming to a tall and slender figure would look absurd on a dumpy person. Furthermore, a fabric suitable to the fortunes and probable gayeties of a person in fashionable city life would be out of place in the quiet parlor of a country home. Figure 1 on the left, illustrates a Parisian bridal costume with long flowing sleeves which could not be imported for under $1000 or $1500 (according to the fineness of the lace). This extremely rich lace dress is layered over white silk. It is a combination of Brussels and point Duchess lace, the graceful design having a border of medallions, as well as, having the same pattern repeated at the height of the knee. The sleeves and body are of white silk with a high corsage. This is invariably the case with French wedding dresses, since the idea of modesty and delicacy, which belongs to the bride, requires it. The corsage has a pointed berthé of lace in the same pattern as the border of the gown, but narrower. A double row of the same lace is on the long flowing sleeves, which are caught up by a knot of white satin ribbon. There is also a sash of white satin ribbon, with silver fringe. 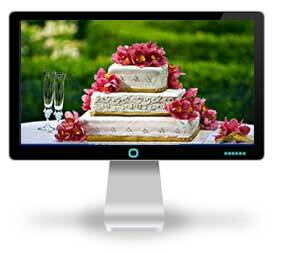 The bride’s hair is turned lightly back from the face, and dressed low, concealing the ear. She wears a wreath of orange buds, arranged as a diadem, with a narrow cordon of buds connecting the diadem with the cache peigné, which droops behind. The veil of Brussels point is arranged quite back on the head to correspond in every way with the bridal gown. Figure 2 features an admirable contrast to the costly Parisian dress and veil. The bridal dress of white silk is one of almost “nun-like simplicity.” The perfectly plain corsage is buttoned with ornamental pearl buttons, and a rich satin waist ribbon. The mousquetaire sleeves have cuffs turned with a simple ruching of the material while the tulle undersleeves include a frill of lace at the wrist. The bride wears a plain illusion veil with a silk cord at the top of the lower hem plus a wreath of orange blossoms mounted in clusters. The wedding dress in Figure 3 is of embroidered French muslin with six flounces of embroidery running up to the left of the skirt and headed by a handsome flounce of lace. The flowing sleeves have flounces and there is a matching square berthé. A spray of blossoms are set carelessly in the left corner and there is a sash of broad thick ribbon. Sprays of blossoms confine the veil, which is worn low on the forehead at each side. Figure 4 is given for the peculiarly novel arrangement of the veil; it is placed so as to shade the face entirely, falling In front across the upper line of the corsage. Figure 5 introduces a bridal gown A la Imperatrice, or gored In front. The trimming, which is a broad ruching of the white silk material, is placed en bretelle on the shoulders, narrowing at the waist line, and then sweeping off gracefully to the hem of the skirt. There is a row of daisy buttons in white blonde lace down the front; and the sleeves are trimmed with the ruching. A single spray of blossoms crosses the forehead, and connects beneath the roll of hair with a similar spray behind. A muslin dress is illustrated In Figure 6. It features eight flounces edged with needlework; the sleeves are headed by two matching flounces. The bride has a full wreath of leaves and orange blossoms encircling her head.